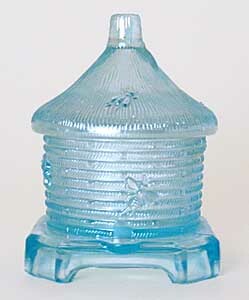 These 5 1/4 inch covered jars were made by Imperial in ice blue (Horizon Blue), 1979-1980 and pink, 1978-1982. 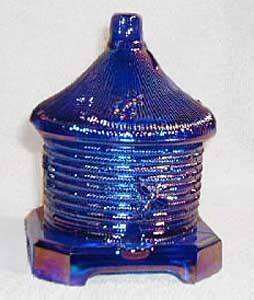 When Imperial went out of business, Boyd bought the mold and has made it in cobalt (shown) and vaseline, with their mark. Any of them sell on eBay in the $15 to $25 range.